Ostrova is a new terrarium, and the Yeren are a new breed of Grendels. Both work with both Creatures 3 and Docking Station. Ostrova is an icy terrarium dumped in space years ago by the Shee, when things went wrong with the temperature valves. 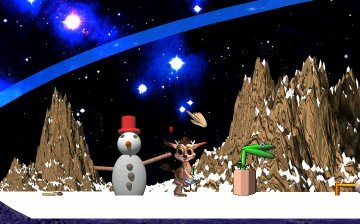 Shortly before things went haywire, some Norns snuck on board with some toys (they wanted to build a snowman) and the Shee, in rather a hurry, forgot to clean up before letting Ostrova drift into space. Now, the Lone Shee has caught up with Ostrova, bringing with him the Yeren Grendels, a new race which he found, that have developed to be like a sort of Yeti/Grendel hybrid. The Lone Shee is ready to test the Yeren Grendels in their new habitat and treat the Norns to some icy fun! The world is full of fun toys and gadgets, and some new wildlife to enjoy! There's a weird snowman, a scary toboggan ride, a penguin, some butterflies, an odd egg (wonder if it hatches), a soup machine, a snowball launcher, pond life and more - all waiting to be discovered! Ostrova can be purchased from the Chaos Store website, for £7.65/$11.99. Ostrova is a rather icy looking terrarium, although it never gets too cold for your Norns unless they start playing with the snowball launchers. There's three levels in the world. The top level has a hill for your Norns to slide down on a toboggan, along with some toys and a magic snowman who'll create some neat things for your Norns. The middle level has some plants and fruit, and an icy lake which can house some beautiful pond life. The lower level is very warm and homely, with soup for your Norns, and a fire to warm them up. The Yeren are an odd new breed of Grendels. They're actually quite cute looking at times, with their big blue eyes, but they do have a nasty streak to them. They can also be bred with other Grendels. Especially cool is the fact that they look quite albino, so the pigmentation only effects some of their limbs and their eyes (and the female's hair), meaning you can get some really great colour combinations.